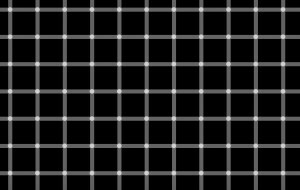 The idea of optical illusions have fascinated me for a long time. Tricks of the mind when you’re seeing something different than what actually is. Our brains make assumptions to make sense of the information from the eyes, and sometimes it has trouble because the depth or the colors confuse it. There are illusion of depth, illusions of color, and illusions of shape. For my project, I’m taking a very influential optical artist, Victor Vasarely, and recreating and manipulating some of his most interesting pieces. 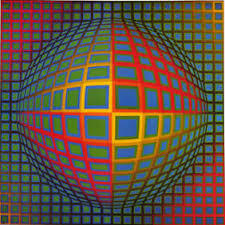 Optical art was a movement in the early 1960’s, and Vasarely stood as the patriarch of that. He had began experimenting with optical illusions in his art in the 1950’s and was featured at the Museum of Modern Art’s show “The Responsive Eye” in 1965 with many other acclaimed optical artists, where he received his first bit of notoriety. Vasarely and other optical artists like Bridget Riley have been influential in my coding of generative art. I really only stuck to coding in black and white and grayscale because it suits me more; however, after researching the optical art movement and really getting interested in depth in a 2-D image and movement in a static piece, I started experimenting in color in my sketchbook drawings and Processing sketches. 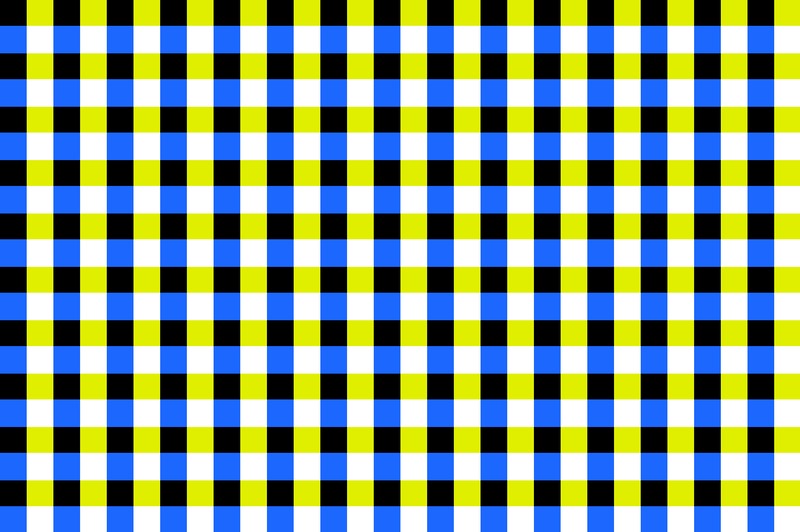 Using certain colors gives off the effect of movement, just like in the checkerboard image above. 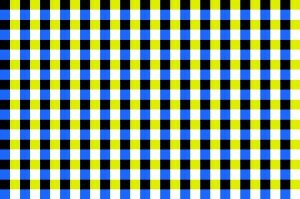 There is very high contrast between the levels of green and blue with the black and white. All it required was a few loops and a little color experimenting, but it had a very effective result. My intentions and hopes for this project are to make anyone that sees my images stare, have to look away for a second, and then not help but look back again. Every single blink of the eye causes the image to change, and your brain will never see it the same way again. I hope to convey the simple concepts that come with making these pieces and the complexity of the results. There is not much information complexity at this point, no noise, no animation, the most complex it gets is the color change, but what will happen if I do add some noise? Take an image that looks like it’s moving and really make it defy expectations. I’m already surprising your unconscious brain, how about I throw in a few surprises for the conscious? Recreating an artist’s work that was originally painted on canvas is no easy task. 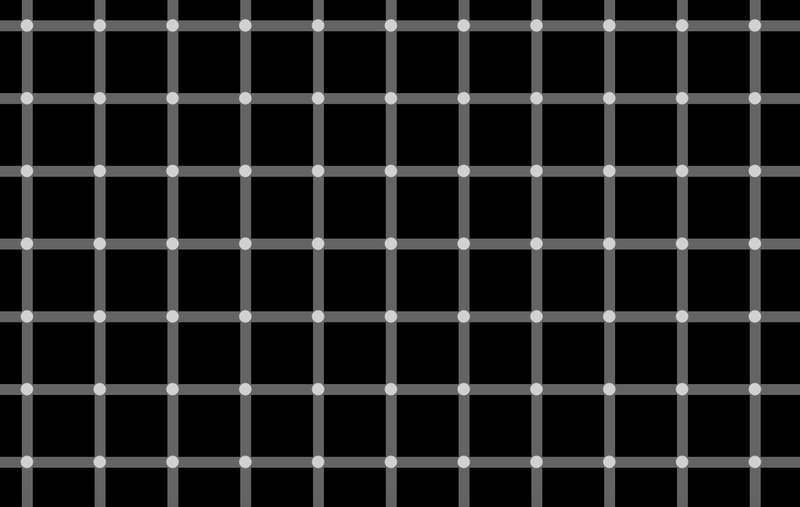 It requires control of a lot of different variables, and although, the concepts used to recreate some of Vasarely’s work aren’t difficult, they aren’t that straightforward to replicate either. Below, in the code of this piece, I used variables and Apple’s Digital Color Meter to get an appearance of a gradient in color. In other attempts at recreating Vasarely, I used arcs and a lot of loops. 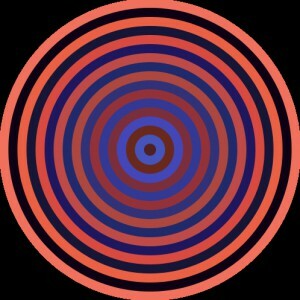 Vasarely uses a lot of circles in his pieces, so I’m constantly the ellipse function in ellipse. Overall, I think color is a very important part of Vasarely, and experimenting in color has been a big lesson for me in coding. My conference project is not what I expected, but I’m pretty okay with it at this point. I didn’t feel inspired just replicating another artist’s work, but once I thought about it as using Vasarely as inspiration was when I started to sit down and really enjoy figuring out how to code his work. It’s not done yet, but I know my final project will end up exactly what I want it be.